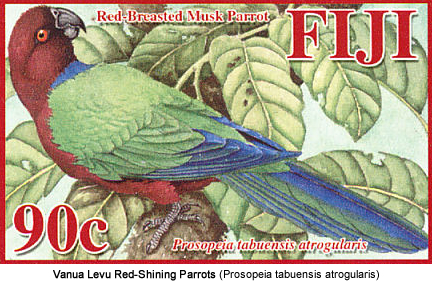 The Red Shining-parrot (Prosopeia tabuensis) is endemic to the islands of Vanua Levu and Taveuni in Fiji. Most populations exist in or near the forests on the islands of Kadavu and Ono. This parrot species was also introduced to southern Tonga - specifically Eua and Tongatapu Islands. Its favored habitats include subtropical or tropical moist lowland and mangrove forest areas. The Crimson Shining Parrot (Prosopeia splendens) is sometimes considered conspecific with Red Shining Parrot (Prosopeia tabuensis) (of, or belonging to, the same species), but may be closer to the Masked Shining Parrots (Prosopeia personata). 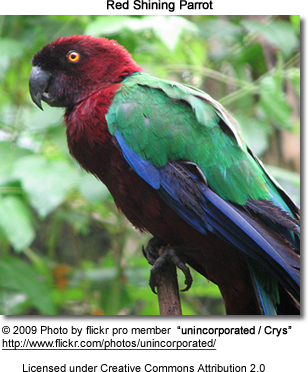 The Crimson Shining Parrot is now considered monotypic (a genus consisting of only one species). 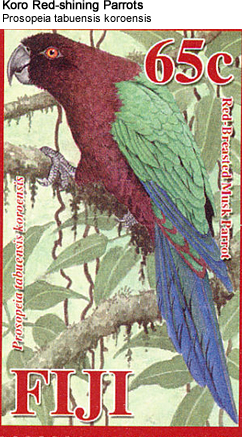 Species ID: The Crimson Shining Parrot is very similar to the allopatric (geographically separated) Red Shining Parrot featured on this page, but the head and underparts are bright crimson instead of the dark reddish-brown that can be seen in the Red Shining Parrot. 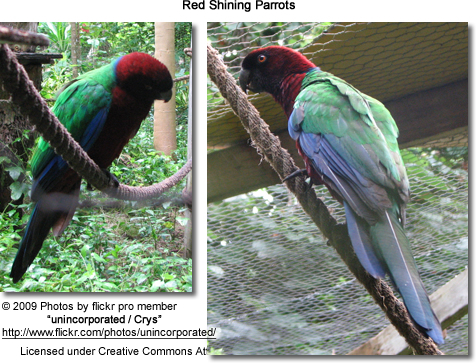 Also, the Crimson Shining Parrot has a broad blue hind collar. The Crimson Shining Parrots are generally smaller than the Red Shining Parrots. The rump feathers lack the red edges that can be seen on the Red Shining Parrots. Collared or Solitary Lory (Phigys solitarius) - the only other parrot on the island of Kadavu. Even though they share some visual features - for the most part the coloring of the plumage is quite different and, therefore, these parrots can't be confused. Additionally, the Red Shining Parrot is much larger and longer-tailed than the Collared Lory. The Red Shining Parrot averages 45 - 46 cm (18 - 18.4 ins) with an average wing length of 230 - 258 mm or 9 - 10 ins). In the nominate form a mixed population of two or more sub-species exist, causing considerable variation in the plumage. The general plumage is dark brownish-red. The forehead and lores (the regions between the eyes and bill on the side of a bird's head) are blackish. The nape (back of the neck) has a blue band of variable width. The wings are green. The back and rump are green with variable reddish-brown edging to the feathers. The tail feathers are blackish on the underside and green washed with blue above. The eye rings (skin to narrow periophthalmic ring) are black. The irises are yellow to orange-red, the feet grey and the bill black. Females look like males, and if gender identification is important (for example for breeding birds), DNA / Feather or surgical sexing is recommended. Immature birds have horn-colored markings on the bill and dark irises. They are relatively quiet during day, but become vocal towards evening at which time they are usually noisy, making a variety of raucous squawks, dry rattles and screeches, repeated in bursts. They also make grating notes, and soft ra-ra-ra-ra when perched. These parrots may learn to talk. In their natural habitat, Red Shining Parrots breed in the cool and dry season, specifically from May to October. They nest in the cavities of dead trees or stumps of palm trees. The nest is lined with rotten wood. In their natural habitat the average clutch size consists of two or three eggs (in captivity 1 to 4 eggs) that are laid in tree cavities. The incubation time averages 24 to 25 days. Only females were observed incubating the eggs and feeding the young. The chicks were fed three times a day independently of the age - older chicks receiving nearly twice as much of food than the younger ones, resulting in considerable losses. The fledging age is reached when the young are between 7 to 9 weeks old. Red-shining parrots are highly prized and very rare in captivity. Captive breeding has seldom been achieved. In the northern hemisphere the breeding season may start in February or March and go on until May or June. As they are at risk of extinction, only the most experienced should attempt to maintain them in their aviaries, and all captive-bred should best be placed into breeding programs to hopefully establish a larger population of these birds and participate in the conservation of this bird species. During the daytime they are generally quiet, although they are quite vocal towards dusk, at which time they tend to be more active. They are often observed flying around at night. They enjoy bathing and a bathing dish should be available at all times. These birds are susceptible during the acclimatization period, at which time they are particularly sensitive to cold. It's important to keep the temperature above 23°C (72°F). Once they are properly acclimatized, the minimum temperature could go as low as 15°C (59°F) - but it should never be allowed to go below that. This energetic species would do best in a planted aviary that is long enough for them to fly to keep them in good physical condition. The recommended aviary dimensions would be close to these dimensions: flight / aviary 5 x 1 x 2 m (15 x 3 x 6 ft). If you have space to build a larger enclosure, even better. The minimum length of the flight would be 14.7 ft or 4.5 m. They enjoy bathing, so it's important to make available shallow water bowls for them to bathe in. An automated misting system would be optimal. A good supply of bird-safe fresh branches with flowers should be available at all times. Also fir, willow and pine branches make good perches for them. Additionally, they should be provided chew toys for exercise and entertainment. Vertical nest boxes of the following dimensions seem to work fine in most cases: 12" x 12" x 40" (~30 cm x 30 cm x 100 cm). Natural diet: They eat a variety of soft and hard fruits, including mangos, papayas, bananas and berries, as well as buds, seeds, young leaves and other plant material, as well as some insects, such as caterpillars. They may also visit farms and gardens, mangroves and secondary forest areas. Captive diet: It's best to stick to their natural diet as much as possible. Therefore, a variety of fruits, such as bananas, mangos, peaches, papayas, and berries (organic only), should be part of their diet. Breeders also feed lory nectar from fruit, pollen, brewer's yeast, rice and multi-grain flakes, dextrose, low fat yoghurt. They like biscuit softened in nectar, fresh branches for chewing with flowers and buds, as well as half-ripe maize. Various seeds - sprouted and unsprouted - should be offered daily. 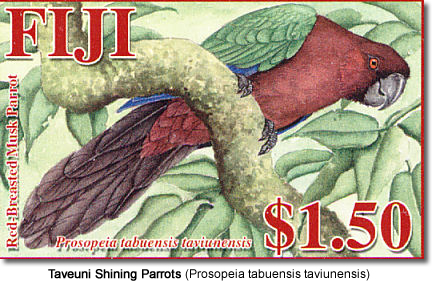 Description: As Red Shining Parrots (tabuensis) - featured above, but without the blue band on the nape. The forehead and lores (the regions between the eyes and bill on the side of a bird's head) are less blackish. There is no or very little reddish-brown edging to the rump. They are also smaller than the nominate species ... Length: 40 cm (15.5 ins), including tail. Wing length: 195 - 227 mm or 7.7 - 8.9 ins. Species: Scientific: Prosopeia tabuensis taviunensis aka Layardiella tabuensis taviunensis ... English: Taveuni Parakeet ... Dutch: Taveuni Pompadourparkiet ... German: Taveuni Pompadoursittich ... French: Perruche d'ile Taveuni ... CITES II - Endangered Species.